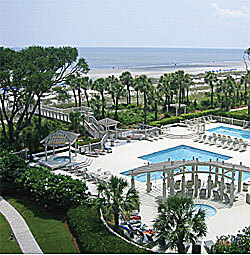 Situated within the exclusive, private community of Leamington on Hilton Head Island in South Carolina, Hampton Place offers property owners a retreat within a retreat, a grand building that speaks of luxury and comfort. Developed in 1997 by Greenwood Development Corp., Hampton Place features 90 units of varying sizes that accommodate couples and families who live there year-round or during vacations. Five different floor plans are available, consisting of one-, two- and three-bedroom villas ranging from 985 square feet up to 1,966 square feet. A three-bedroom unit features a covered balcony, screened porch, wet bar and a spa tub with separate shower. Amenities seemingly are endless, including a pool and outside hot tub, tennis center, world-class golf, easy access to the beach, marina privileges, playground, grill area, covered parking, conference facilities, storage and more. Hampton Place offers spacious living and dining areas and spectacular views of the Atlantic Ocean, and it is within walking distance of the Arthur Hills golf course that is part of Palmetto Dunes. Palmetto Dunes consists of nearly 2,000 acres of land, including three miles of hard-packed white sandy beach, 11 miles of a man-made lagoon system that is perfect for canoeing, fishing or kayaking, and access to the 170-slip marina community of Shelter Cove Harbour. This residential resort community offers energy for those who like to be on the go as well as a sense of peace for those who simply enjoy taking in the environment and its inhabitants. Located near the center of Hilton Head Island, Hampton Place offers easy access to many island activities, including the theater, shopping, dining and water-related sports. community parks, where many recreational team sports, including soccer and baseball, are played, also are nearby.